It can be difficult engaging children when it comes to reading. Developing literacy skills is often a challenge for parents as well as teachers. When I was a child, I adored the Story Teller series and can still recount most of my favourite stories, along with their illustrations. Colourful graphics and simple exercises that engage the reader play pivotal roles when encouraging children to read. Storytime magazine does just this. With its fifty odd pages of stories, puzzles and games, it is the ideal tool for accompanied reading. 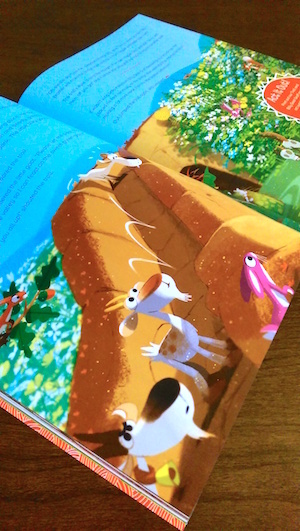 The images are vibrant, immensely colourful and tell each story with charm. Aimed at Early Years to KS2, stories are in abundance and each has an simple optional exercise to follow, along with other facts associated with the story. When reading through, I noticed the distinct lack of adverts – no unnecessary distractions! The magazine has become significantly popular with TAs in recent months and it’s not hard to see why. 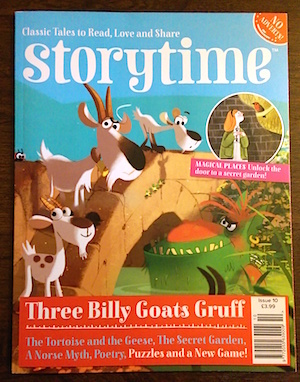 TAs have found Storytime magazine a considerable help when it comes to helping children to read. The stories are short enough to hold a child’s attention span and the puzzles/games are exciting and adventurous. Not to mention, the production quality is better than any magazine I’ve ever purchased! Suitable for boys and girls up to year 4. Great for reluctant readers, where a magazine format might be more engaging for them than a book. Wide range of short stories in each issue means there’s something for everyone. The focus on traditional tales is a perfect fit with the curriculum. Each story is checked by a literacy expert. Puzzles and activities in each issue to keep children’s attention and bring the stories to life. Printed on good quality paper so each issue lasts a long time. Ofsted recommend that schools encourage pupils to read more widely for pleasure and develop policies to promote it both at school and at home, and Storytime works really well here. ** Up to 35% discount off a year’s subscription, plus a free issue! Simply visit www.storytimemagazine.com/tafocus and choose your subscription. We would like to know more about TA/SEN related books you have read, which have helped developed your knowledge or improved skills in the classroom. A number of great titles have been recommended to us since this website was launched and we would like to review the most popular. As a Teaching Assistant, behaviour management is more than likely a key part of your job description and is something we deal with in all aspects of our lives. How often do we change the way we communicate with people, based on their temperament? Part of your work as a Teaching Assistant will involve positive interactions with pupils to encourage the best outcome in any situation. The Teaching Assistant’s Guide to Managing Behaviour, written by Jill Morgan (available on Amazon.co.uk), is a helpful and engaging handbook for developing strategies and encouraging pupils to understand why their behaviour may be unacceptable and enabling them to take responsibility for their actions. We have generously been provided with two copies of The Teaching Assistant’s Guide to Managing Behaviour by Bloomsbury Publishing for two winners. All you have to do is ‘leave a reply’ below with an example of a behavioural problem you have faced and how you dealt with it. You don’t have to give your real name, but your answers will help other Teaching Assistants in similar situations. The closing date for all entrants is 30th June 2014. We will notify two winners after the closing date, who will receive one copy of the book each. Our competition is open to UK residents only. Once notified by us, the winners will need to provide a UK address to send the prize. Your email address is required for the competition and will not be shared with any third parties. By entering, you agree to be bound by these rules in relation to this competition. Bloomsbury’s academic division publishes around 1,100 books a year, with a significant presence in the humanities, social sciences and visual arts. For more information about their full range of digital services, textbooks, course books, journals, research monographs, reference works, and professional books in your subject area, please visit the official Bloomsbury website. 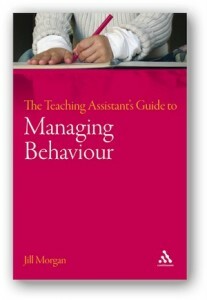 Jill Morgan’s The Teaching Assistant’s Guide to Managing Behaviour is a brilliant addition to the Teaching Assistants Series of books by Continuum (Bloomsbury) publishers. This covers the different perspectives of behaviour and our own philosophies. Theories are discussed with some practical exercises. Cultural differences and factors influencing behaviour are included. The chapter covers the triggers, behaviours and consequences. A number of exercises are included throughout. Setting clear expectations for pupils is essential, which involves input from the school, the teacher and TA. This chapter includes transition time, routines/rules and adult behaviour. This chapter covers the rewards for good behaviour and sanctions for bad behaviour. What types of rewards are effective (while supporting the teacher’s incentive plan)? Sanctions will be restricted to school policy. How bad is ‘bad behaviour’? Some recommendations are given on how to deal with specific situations, behaviour management plans, a case study and how to get pupils to evaluate their own behaviour. A summary plus some general principles. 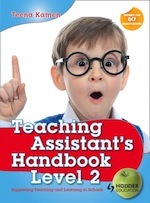 This article is a continuation summary of the Teaching Assistant’s Handbook Level 2 by Teena Kamen, chapters 7 to 14. Summary of the first part of the book. A guide for the QCF unit ‘Supporting Learning Activities’. including cognitive developmental theories such as Piaget, Vygotsky and Bruner. Learning pathways and experiences are mentioned and activities are encouraged, in order to think about the process of learning. Long, medium and short term plans are discussed with key tasks and how the teaching assistant supports the teacher. The chapter includes details on how to plan learning activities based on individual needs – including selecting resources and observation and recording of responses. A planning sheet example is provided. Each aspect of preparing, delivering and evaluating the learning activity is discussed in detail. A guide for QCF unit ‘Support positive behaviour’. The eighth chapter of this book talks about the expectations of behaviour – parental and school expectations. Pupil behaviour is influenced by a number of external factors, which are discussed. There are 8 suggested ways to encourage children’s positive behaviour and how staff in schools act as role models for the pupils. Examples of ‘school code of conduct’ are given. Rewarding pupil behaviour is an important part of this chapter and details are given on how this can be implemented. Difficult behaviour is discussed, along with how to recognise patterns of behaviour. Plans to help support difficult behaviour are given. A guide for QCF unit ‘Improve own team and practice’. This chapter focuses on the effectiveness of teamwork and the importance of communicating with colleagues. There are a number of ways teaching assistants interact with other members of staff and this chapter encourages and examines positive working relationships. A guide for QCF unit ‘Support the use of ICT for teaching and learning’. ICT (Information and Communication Technology) is stressed as an important part of the national curriculum in this chapter and safety around the equipment is discussed. School policies and data protection are detailed and the various skills at primary/secondary school level. A detailed list of ICT risks are included and how to deal with them. There are various aspects to the preparation of classes, such as adequate floor space and lighting/ventilation. Organising and checking classroom resources is an important part of this unit. Another important aspect is supporting English as an additional language. This chapter focuses on SEN (Special Educational Needs) and the legislation related to the topic. Assessments and plans are detailed – an example of an Individual Education Plan is given. Most importantly, the roles of those who support SEN pupils are given and a list of ways to support these pupils are detailed. As an SEN teaching assistant, you would need to know exactly how to move pupil’s with physical disabilities. This chapter gives information on how this is done. This chapter explores the basic knowledge of food hygiene, preparing food and also dietary requirements. Schools trips and the safety of these trips are explored. A guide for QCF unit ‘Support Assessment for Learning’. This chapter explores ways to help pupil’s development and raise achievements. Formative assessments and learning goals are discussed along with assessment forms and school reports. Social – the way in which children’s social development can be supported are discussed, including behavioural patterns and self awareness. Recognising and supporting children’s transitions are noted for age groups i.e. age 3 to 11 years will require reassurance and explanations or age 11 to 16 will require open days/evenings and career advice when going through transitions. This chapter also discussed the law regarding safeguarding children according to the Children Act 1989 and Children Act 2004. The referral process is explained and how teaching assistants can identify signs of abuse. Helping pupils to protect themselves against abuse or being bullied is also detailed. A guide for the QCF unit ‘Communication and professional relationships with children, young people and adults’ and ‘Maintain and support relationships with children and young people’. This chapter details the importance of creating positive, professional relationships with pupils and the types of positive interactions. Communicating in a positive and clear manner is essential, so notes are provided on how best to communicate, including how to actively listen. The importance of praise, encouragement and support is highlighted, along with ways in which behavioural problems are tackled i.e. meeting the standards of the school. A common problem tackled by many teaching assistants is the emotional outburst, which this chapter covers and details the way these outbursts should be handled. Helping pupils deal with conflicts such as jealousy or disagreements is noted and examples given. Good communication with adults is essential as teaching assistants will be regularly reporting back to colleagues, carers and parents. Best practise for confidentiality and the Data Protection Act 1998 are detailed. A guide for the QCF unit ‘Equality, diversity and inclusion in work with children and young people’. This chapter details the rights and needs of children and how these rights have changed over the years to now include rights to express views and engage in play. The United Nations Convention on the Rights of the Child are detailed along with legislation. Cultural diversity, disabilities and gender are discussed with regards to promoting a positive attitude and the ways teaching assistants should approach these issues. A guide for QCF unit ‘Schools as organisations’. This chapter details the UK education system and how it works, from pre-school to further education. Alongside this is the description of the school workforce and the roles/responsibilities. The teaching assistant role is covered in detail regarding the role and how it supports those within the workforce and the pupils. Examples of job descriptions are included and also the procedures for grievances and staff code of conduct. A guide for QCF unit ‘Support children and young people’s health and safety’. 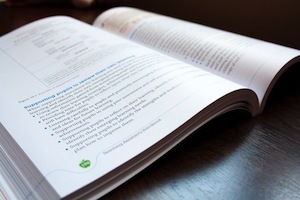 This chapter covers the maintenance of health and safety during learning – i.e. how risk assessments are carried out and how equipment must be stored (an example of a risk assessment form is shown). Play areas are required to be safe and clean so tips on how to maintain play areas are given. School evacuations and procedures for missing pupils are also documented, along with procedures for accidents (administering first aid and completing accident/injury forms).